Turn your backyard into an adventure park! Most people agree that Slackers zipline kits are one of the most exciting items that you can put in your backyard for hours and hours of enjoyment. The ziplines help improve strength, athletic skills, and balance all while riding a just a few feet off the ground. Turn your backyard into an adventure park! 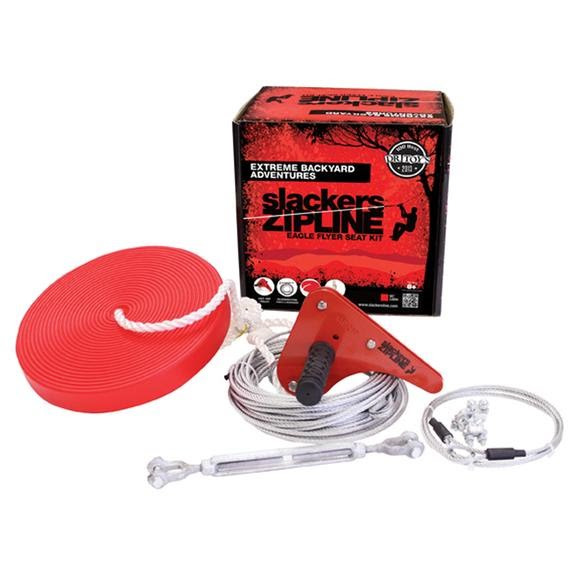 Most people agree that Slackers zipline kits are one of the most exciting items that you can put in your backyard for hours and hours of enjoyment. The ziplines help improve strength, athletic skills, and balance all while riding a just a few feet off the ground. There are less parts to assemble, which means our kit is easier and faster to set-up than others. Get started ziplining in 30 minutes. Very thorough instructions to help give you guidance on where, how to set up and riding details. Only tools needed are pliers and wrench. Two people suggested for set up! Trolley has sealed ball bearings that help maximize strength and speed. Trolley handles have exceptional grips for non -slip and easy comfort. Great fun for ages 7 and up! Maximum load factor is much higher than the 250 LBS maximum suggested. Specially designed hardware bracket allows rope and seat length to change for different riders&apos; height.